Q. What is the intended use? A. The BioCheck® Kit is a fast, easy to use, reliable and inexpensive test for first responders to screen suspicious powder samples for the possible presence of a bioterror agent. This reduces the need for more time-consuming, expensive specific agent field and laboratory testing for the majority of ordinary substances (e.g., sugar, drywall dust, and cornstarch) that frequently cause alarm. Use of the product greatly reduces the fear, cost and inconvenience associated with ‘false alarms’. A positive result with the kit indicates the need for further testing for specific bioterror agents. Q. How does the kit work? A. The kit first determines the presence of protein in a sample and then tests the pH of the sample. Samples are collected using treated swabs provided with the kit. The presence of protein (change to a purple color in the Protein Solution) indicates that a biological agent may be present. The pH test provides additional information about the sample. Materials containing dangerous biological agents are likely to be of neutral pH (no change in color in the pH solution). 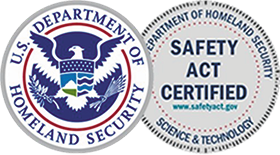 The dual protein and pH testing of suspicious samples is in alignment with The Department of Homeland Security’s Center for Domestic Preparedness recommendations. Q. How is the kit used with other tests? A. . Most field tests are designed to test for one specific agent. With these products, a negative result for anthrax says nothing about the possible presence of other biological agents. BioCheck® allows the user to rapidly screen for any potential pathogens. Most users begin by testing the suspicious powder with the BioCheck® Kit. Agent-specific or chemical analysis is then performed (according to departmental SOPs) if the BioCheck ®test is positive. The ability for BioCheck® to rule out most powders as biologicals saves time and money. Q. Has the product been tested by independent labratories? A. Yes. The product has been evaluated US Army’s Edgewood Chemical Biological Center using live Bacillus anthracis spores, Yersinia pestis and ricin. It was determined that BioCheck® is an effective tool for screening of suspicious powders. BioCheck® has also been tested by The Battelle Memorial Institute where it performed within specifications. In addition, the Metropolitan Health Research Center in Tokyo, Japan, completed testing of the product and found that in 10 out of 10 tests, anthrax was detected using BioCheck®. Q. What is the sensitivity of the kit? A. The product is designed for detection of visible amounts of powder. Testing has determined the level of detection for Bacillus anthracis spores (8x10e7 CFUs), Yersinia pestis (8x10e7 CFUs) and ricin (20µg). BioCheck® is not designed for environmental sampling or testing for individual poisons. Q. What is the incidence of “false positives”? >10µg) to react with the reagents. Many ordinary substances (e.g., cornmeal, whole wheat flour) contain protein and will give a positive result. However, Field test results show the presence of protein in less than 20% of samples tested. These samples are ‘positive’ for protein; whether they are ‘positive’ for bioterrorism agents can only be determined by specific tests. Q. What is the incidence of ‘false negatives’ with the kit? A. incidence of false negatives (i.e., no color change even if a bioterror agent is present) is very low, if the kit is used correctly. Following the kit instructions and conducting the test at room temperature is of paramount importance. It is important to note that the lethal dose of some agents can be dispersed in quantities that are below the limit of detection for BioCheck. However, these low quantities are unlikely to constitute a WMD. Q. What is the effect of temperature on kit performance? A. The color change in the presence of protein will happen more quickly in warm temperatures and more slowly in cool temperatures. Q. What is the best way to collect samples with the protein swab? A. It is important not to ‘overload’ the swab. Place the swab in the powder and roll it over one time so that the surface of the swab head is covered. Tap any excess powder off the swab before placing in the protein test tube. Q. How should dispose of the kit after use? A. The kit should be discarded according to your department’s guidelines. The BioCheck Kit contains no hazardous reagents however the materials tested with the kit are unknowns and should be handled accordingly. Q. What is the shelf life of the kit? A. The product is produced with an expiration date of 14 months from date of manufacturing. We guarantee at least 12 months of shelf life in every order we ship. A. The color change in the presence of protein will happen more quickly in warm temperatures and more slowly in cool temperatures. Store the kit at room temperature. Q. How should the kit be disposed of after use? A. The kit should be discarded according to your department’s guidelines. The BioCheck® Kit contains no hazardous reagents however the materials tested with the kit are unknowns and should be handled accordingly. Q. I have kits that are recently expired – what do you recommend? A. Expired kits cannot be used in the field. Kits may be used for training new team members or in demonstrations to other departments. Copyright © 2019 20/20 GeneSystems Inc | All Rights Reserved. BioResponse® is a business unit of 20/20 GeneSystems Inc.